As a teaching artist, Thad presents arts infusion programs in preschool, elementary, middle and high school classrooms each year, teaching curriculum-related topics through music. He has conducted more than 300 long-term residencies during his career as a roster artist for multiple state and local arts council organizations in the midwest and on the east coast. He has worked with programs such as Accessible Arts, Wolf Trap Institute for Early Learning Through the Arts, Arts Partners, KU Lied Center Art Teach, and Salina Arts Infusion. Thad's residencies bring creative musical opportunities to all ages. Core Residencies can be combined with single classroom visits or performances for non-core or community groups. He provides participants up-close and personal experiences for a more in-depth understanding of creative processes for students and easily accessible strategies for teachers. Residencies come in a variety of forms and are designed for those involved. Choose one of the following residency topics, or work with Thad to design one unique to your community. 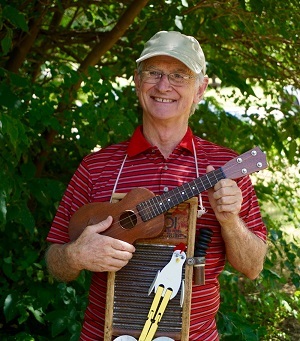 Programs are adaptable for all ages: Preschool, Elementary, Middle, High, and Community Instruments Thad uses for his programs might include: ukulele, guitar, harmonica, limber chicken, washboard, bucket bass, fiddle, banjo-uke, Plains Indian flute, and rhythm instruments. Musical styles may include original folk, traditional, old-time, tin pan alley, country blues, and ballads. Celebrating Nebraska’s 150th Anniversary of Statehood, “Nebraska the 37th Star” features original songs about Nebraska history and heritage. While learning the history of their state, students sing along, play in the band and help create their own performance. The Songsmith Songwriting Residency has core groups learn writing skills involved in the song creation process, including rhyming, alliteration, lyric writing and music exploration, and for older students may include researching topics, using oral history interviews and questionnaires, all while exploring topics of Nebraska history, heritage and culture. Residency outcomes have yielded songs, student performances, publications, artwork and audio/video recordings. Thad’s Band in a Bucket sessions include demonstrations and instruction on how to make and play old-time and unusual instruments, such as the bucket bass, washboard, shakers, can drums, limberjack and flyswatters. Singing Science may include short songwriting activities, language arts, performing, creative drama and movement. Grades K-2 experience Life Cycle Songs and older groups go Down in the Swamp to transform their classroom into living, breathing, singing swamps. Dust Bowl Remix - The program begins with an introduction to the Dust Bowl and live performance of original songs. Students compare lyrics and re-write to relate to modern day themes, then perform with simple rhythm and string instruments. This is a one session class visit (50-60 minutes). Postcards from the Dust Bowl - Students experience the "Dirty Thirties" by listening to live performances of a collection of original songs. They invent a persona and write about their character's experiences during the dust bowl, sketch and create postcards. This residency workshop includes a Dust Bowl Remix session and needs 4-5 class sessions to complete.